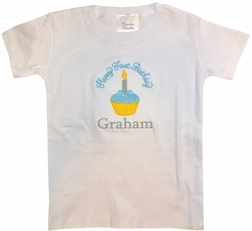 Home > Birthday Clothing & Outfits > BOYS > Boy's 1st Birthday Cupcake Happy Birthday Monogrammed Shirt. Sweet little white shirt for his 1st birthday. 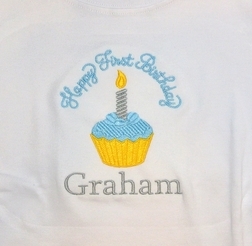 The saying "Happy First Birthday" is embroidered in blue over the cupcake and your little one's name is embroidered under the cupcake.